Survivor: Heroes v Healers v Hustlers (2017) - 8th place, 11th out - 4th juror. Voted out in Episode 11, "Buy One, Get One Free" (Day 30). Heroes v Healers v Hustlers Ep. 2 RC/IC: "Crossroads" - Sits out, as the Healers win again (1st/3). Heroes v Healers v Hustlers Ep. 5 IC: "Rice Race" - Moves the rice, retrieves the balls; Levu doesn't lose (2nd*/3). Heroes v Healers v Hustlers Ep. 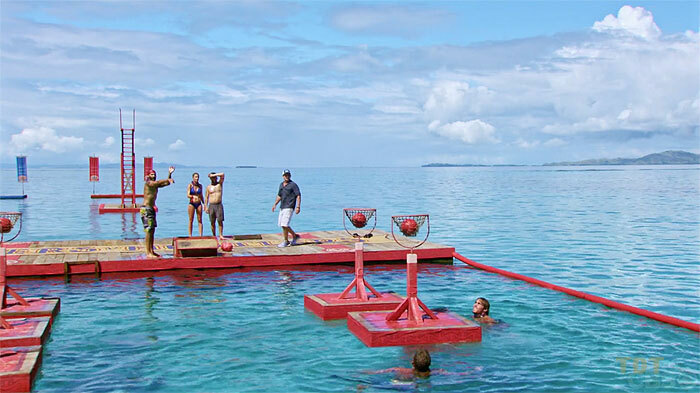 6 RC: "A-Tension Span" - Helps move the boat, takes a slingshot shot; Levu loses (3rd/3). Heroes v Healers v Hustlers Ep. 8 RC: "Air Raid" - Randomly chosen to sit out, gets to enjoy reward anyway. Heroes v Healers v Hustlers Ep. 9 RC: "Hear About It Ladder" - Unlocks the crates, shoots all 5 hoops; red team wins. Heroes v Healers v Hustlers Ep. 11 RC: "Kenny Log-Ins" - Helps paddle and haul logs, blue team wins! Heroes v Healers v Hustlers, Ep. 7 IC: "Will It Go Round" - Eighth person to drop out (5th/12). Heroes v Healers v Hustlers, Ep. 8 IC: "Ten Foot Pole" - Second person to drop out (10th/11). Heroes v Healers v Hustlers, Ep. 9 IC: "Squatty Probst" - Fifth person to drop out, fairly quickly (6th/10). Heroes v Healers v Hustlers, Ep. 10 RC: "The Game is Afoot" - Starting on the top layer, but doesn't win (5th/9). Heroes v Healers v Hustlers, Ep. 10 IC: "Bermuda Triangles" - Lasts over 20 minutes, but third person out (4th/9). Heroes v Healers v Hustlers, Ep. 11 IC: "Driving Wheel" - Working on the final word puzzle, but loses (tie-3rd/8). Heroes v Healers v Hustlers, Ep. 2: With Cole's assistance, finds the Healers' idol (Day 5). Heroes v Healers v Hustlers, Ep. 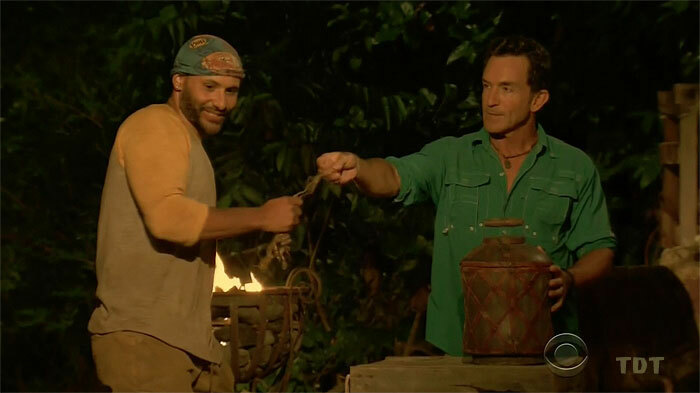 4: Plays the idol for himself, voiding two votes & avoiding a tie (Day 11). Heroes v Healers v Hustlers, Ep. 6: Finds the Levu clue during the day, digs up the idol at night (Day 15). Heroes v Healers v Hustlers, Ep. 7: Plays the idol for himself, no votes voided (Day 19). Heroes v Healers v Hustlers, Ep. 8: Four votes, from Ashley, Chrissy, Cole, and Mike. Heroes v Healers v Hustlers, Ep. 10: One vote, from Chrissy. Heroes v Healers v Hustlers, Ep. 11: Four votes, from Ashley, Ben, Devon, and Lauren (voted out, 4-2-). Sinking the final shot. Red team wins! Josh Wigler at The Hollywood Reporter (9/12/17): "Player Profile: Meet Joe Mena"
Gordon Holmes at XfinityTV.com (11/30/17): "Joe: 'I Had No Idea that the Three Stooges Allowed (Ben) to Be That Sleeper Cell'"
Mike Bloom at Parade.com (11/30/17): "Joe Mena on BOGO, Coco, and Braggadocio"
Josh Wigler at The Hollywood Reporter (11/30/17): "Joe Mena Reveals Three Fatal Mistakes"
Rob Cesternino at RHAP (11/30/17): "Latest Exit Interview - 11/30/17"
"Pet peeves: My biggest pet peeve is that fake energetic, fake smile, person that we all know. Also, someone who does not take responsibility for their actions, and is constantly giving excuses. Let's not forget that individual that must have one up on you. What's your personal claim to fame? Obtaining my degree. This is something I'm proud of because it has given me the opportunity to secure my career and that has given me the lifestyle where I have the ability to provide my children with their wants, needs, and a lovely home that they can call their own. Without my degree, I wouldn't have been able to accomplish this. Who or what is your inspiration in life? A hero is someone who is noble and will not let you down. My sisters are my heroes—they are noble, loyal, and love me unconditionally. If you could have three things on the island, what would they be and why? Me, myself, and a picture of my children. I don’t think I would need anything but a picture of my children. A picture would provide me with a tangible image of them instead of just a mental image. Which Survivor contestant are you most like? 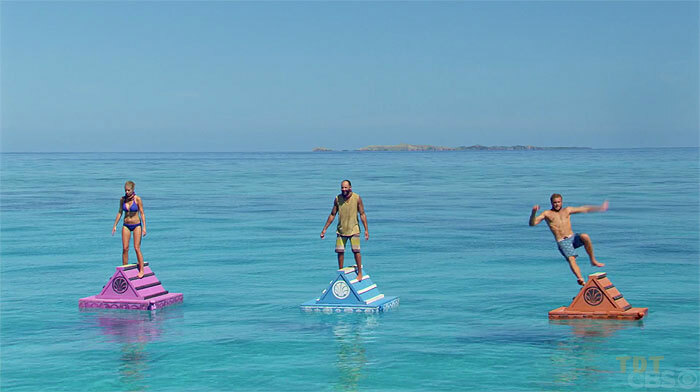 Tony Vlachos' understanding of how to manipulate others, Mike Holloway's "balls to the wall" attitude, and Jeremy Collins' ability to stay true to himself. What's your reason for being on Survivor? Mo money baby! Of course the million dollars. I play "survivor" 40 hours a week at work. It would take me 10 plus years to earn a million dollars at my current work rate. Why not speed up the process and make a million in six weeks? It’s a no brainer. In addition, I always tell my son that he needs to give 100 percent in everything he does. I'm constantly telling him "go hard or go home." I just want him to see that what I preach, I also apply to myself. Why do you think you'll "survive" Survivor? I can relate to people from all paths of life, I work in a diverse community with diverse backgrounds in age, religion, and social status. I can converse with anyone about anything. With these stories, I’ll be able to manipulate individuals and my surroundings. I'm a likable, outspoken, and natural in most things I do. Nothing I do feels forced or uncomfortable. I'm well aware of my strengths and weaknesses. I'm not going to Survivorfor vacation or fame. I'm not going to be away from my children for six weeks and come back empty handed. I can win this and I am confident I can."